The traditional definition of what it means to watch TV and how to watch it have drastically changed in the past 10 years or so. Consumers are in control more than ever of what they watch, when they watch and how they watch. If watching TV meant sitting in front of the screen, waiting for a favorite program at a set time, today, the growth of video-on-demand (VoD) where viewers can download or stream content from either a traditional TV package or SVoD is creating massive opportunities for consumers. The number of reported VoD viewers is growing by the day. Nearly two-thirds of global respondents (65%) in a Nielsen online survey covering 61 countries said they watched some form of VOD programming, which includes long and short form content. VoD has become a part of daily viewing habits for many people. 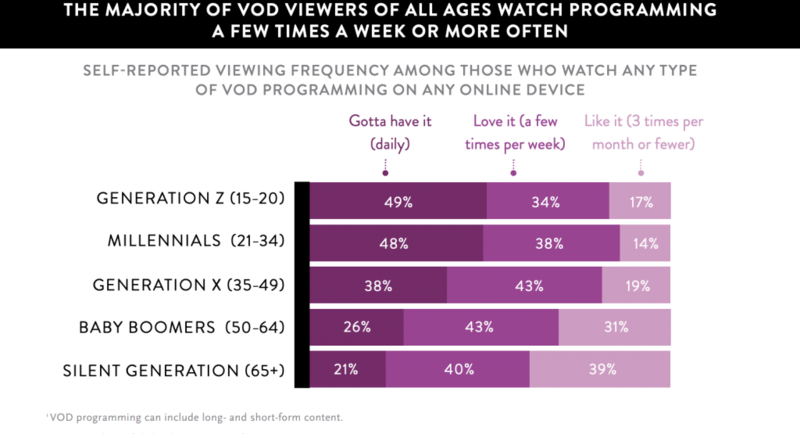 Among those who watch any type of VoD programming, 43% say they watch at least once a day. Most of these viewers are supplementing, rather than replacing, paid traditional TV services offered by cable or a satellite providers. Nearly two-thirds of traditional TV-package subscribers in the survey plan to maintain their subscriptions, but nearly one-third say they plan to cancel their service in favor of an online-only provider. What VOD Rising Popularity Mean for Future Viewing Patterns? SVoD is gaining momentum globally but especially in the U.S. market where data shows that homes with SVoD services watch less TV. The answer to this is that most SVoD users tend to be younger and have lower TV viewing levels. SVoD households also have higher digital device ownership compared to general population. Almost one-third (32%) of SVoD users have traditional TV services but plan to cut the cord. This is more common in Asia-Pacific where 44% of respondents indicate they plan to cancel their cable or satellite subscription plan for a SVoD service. Less than one-quarter of Latin American (24%), North American (22%) and European (17%) respondents have also intentions to cut the cord. The growing trend of online subscriptions is amplified by popularity among younger generations. Just to clarify, 31% of Generation Z (ages 15–20) and Millennial (ages 21–34) confirm they pay for online content subscriptions, compared to 24% of Generation X (ages 35–49), 15% of Baby Boomer (ages 50–64) and 6% of Silent Generation (ages 65+). VoD is one of many entrants in the fragmentation of media. It represents a continuation of some sorts in the media industry happening for more than a decade. This fast changing pace isn’t going to slow down anytime soon. It’s a huge challenge to win over viewers so content providers must stay agile, flexible and ahead of their competition. As many times before, we’ll say it again – high quality content will always dominate no matter the platform or device on which is viewed. Although there is huge media competition nowadays id doesn’t mean that the demand for quality has lessened. It has gained importance more than before because viewers will not settle for something of a less quality. The secret here is not quantity but rather quality. Quality content may be a necessity, however it’s not enough. Programming is destined to fail if audiences don’t get it or can’t simply access it. With a huge—and growing—number of options available, mastering content discovery becomes even a lot more essential. Smarter discovery interfaces and content recommendation algorithms that predict what users might like. This ought to be a key innovation space for content suppliers. Consumers are looking content on their own terms and they’re looking for even more management. Progressively, they’re piecing along packages that deliver all the programming they need while not the excess of channels that don’t. Savvy content suppliers are recognizing this trend and catering their offerings consequently. Additionally, seamless integration of content across devices is going to be important as viewers mature looking content anyplace, anytime, on any screen.